I am SO excited to tell you about one of our new cookbooks for the month of August! This is a cookbook that I received as a gift for my 21st birthday from my in-laws, and I absolutely LOVE LOVE LOVE it. As soon as I took on the role of Director of Licensing, this is one of the first books I sought out to license because I knew I wanted to share it with you. 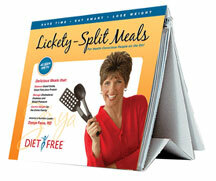 It is called "Lickety Split Meals: For Health Conscious People on the Go", by Zonya Foco, and it may be one of the most used cookbooks in my kitchen! Some of you may have heard of Zonya Foco. She has gone all through the country speaking and teaching people how to be healthy WITHOUT dieting. She teaches the "Eight Healthy Eating Habits for Life", and has taught them from both a speaking platform and her own TV show. Her website, Zonya.com, has a lot of information on it that you may find helpful. She is incredibly fun to watch, she has more energy in her pinkie than I do in my body! She is extremely qualified to write this amazing cookbook, and this cookbook is chock full of not only great recipes, (and I mean GREAT), but it also has over 170 fitness, nutrition, and time saving tips in it as well. These tips are great to help teach good nutrition while still feeling satisfied, and you don't have to count calories. The chapters in this cookbook are very unique, instead of just the standard "breakfast, lunch, dinner"; her chapters are more like this: 15 Minute Meals, 30 Minute Meals, Oven-Exercise-Eat, Stir Fry, Slow Cooking, and more. There is even a chapter of 1 Minute Mini-Meals and 5 Minute Meals when you need quick snacks, lunches, and treats for your active, and very busy, families. There is a great chapter of desserts, including the Simple Summer Fresh Fruit Pie-which I could eat every day for the rest of my life! The recipes in this cookbook are not only delicious and so incredibly simple to prepare, but they are healthy and filling. Since this is NOT a diet cookbook, the recipes still taste like real meals, not like you are missing out on something. The tips alone in this cookbook are invaluable, but I really do love the recipes. I like mentioned earlier, I use this myself-A LOT. Here are a few of my favorite recipes that I highly recommend you try when you get this cookbook: Breakfast Casserole, Mexican LaZonya, Grilled Beef Teriyaki, Miracle Soup, Beef Barley Soup, and Cheesy Potato Skillet with Mixed Vegetables (I add sauteed chicken to this for my husband's somewhat carnivorous taste buds). And for dessert try that Simple Summer Fresh Fruit Pie, or try the Hot Fudge Brownie Cake! The best way to describe this cookbook is how Zonya herself describes it in her introduction: "After six years of college, nine years of marriage, and eight years as a Registered Dietitian working with clients who inspired me, I created the complete countertop coach cookbook that I had never found. The initial idea quickly grew into the form of three books in one: a collection of easy-to-follow recipes that included directions for getting an entire meal on the table; a complete grocery list with advice on stocking your pantry; and a powerful collection of inspiring tips and useful nutrition information for losing weight and gaining health." If you want to eat healthy without dieting, or want to learn how to get a full meal on the table, or simply want to serve up delicious, healthy, satisfying meals to your family, this cookbook is the way to go. 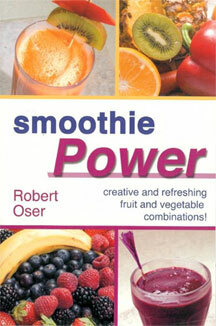 Our other new cookbook release for the month of August is called "Smoothie Power". Here is part of their introduction to get you in the smoothie zone: "Imagine for a moment preparing a food so delicious that it will please almost everyone, regardless of age, gender, religious or political affiliation, nationality or culture, occupation, or lifestyle. Imagine that this magical food is inexpensive to prepare, and doesn't need fancy or expensive equipment or time-consuming, labor-intensive techniques to prepare. Imagine also that it can be made by almost anyone - even a child - regardless of their culinary experience, usually in a matter of a few minutes, without cooking and little to no chopping." Sounds great, right? Well, smoothies truly are all that and more! Smoothies are one of the best ways to cool down on a hot summer day, and they really do make great breakfasts, after-school snacks, desserts, and "just because" treats. This cookbook has so many incredible recipes, and they are so creative! Most of the recipes feature at least one kind of fruit, often more than one fruit for delicious combinations. However, there are plenty of chocolate, coffee, and exotic smoothies to please any palate. The cookbook begins with a few helpful tips; my favorite was a section on how to rehydrate dried fruit to be used in smoothies! I loved this idea since dried fruit, bought in bulk, is a cheaper alternative to fresh fruit sometimes, and then the fruit can still be stored for a longer period of time. I never thought to rehydrate dried fruit to use in a smoothie! There are also lots of tips for buying, storing, and preparing the fruits that are used in the cookbook, which is so helpful! There is also a section on different types of healthy natural sweeteners so you can enjoy as many smoothies as you want - guilt free! There are also all kinds of tips on adding "boosts", for added protein, fiber, Omega-3 and Omega-6 fatty acids, antioxidants, and other nutritional additives that can also add thickness and flavor to your smoothies. There are some great flavorings that I had never thought of in smoothies before like chamomile, cloves, and allspice. The chapters speak for themselves about the variety of smoothies offered: Breakfast Smoothies, Simple and All Fruit, Exotic Smoothies from Distant Lands, Dairy/Non Dairy Milk Based Smoothies and Frappes, Athletic and Healing Smoothies, Shakes and Dessert Smoothies, and Party and Holiday Shakes! Who knew there were so many kinds of smoothies out there? This is an excellent cookbook for a great summer treat, as well as for a fun and guilt free indulgence any time. Here are a few of the smoothies you will find in this book: Tahitian Sunrise Tropical Breakfast Smoothie, Persimmon Cinnamon Smoothie, Thai Ginger Pineapple, Savory Coconut Mint Lassi, Papaya Creamsicle, Peach Chai Smoothie, Candy Bar Shake, New York Cheesecake Smoothie, Cherry Vanilla Creme Frappe, and Strawberry Kahlua Shake. Now, tell me, isn't your mouth watering? Cook'n Club members - don't forget that you get one cookbook for FREE every month! If you aren't a member of the Cook'n Club yet, this is the month to become a member because I guarantee you will want both of these cookbooks! Click here to sign up!